We are a leading Manufacturer of teppich carpets from Jaipur, India. By keeping track of industry development, we are involved in offering a high quality Teppich Carpets. Our offered teppich carpets are precisely designed using the finest quality material like threads & yarns keeping in mind the latest trends of market. These teppich carpets are checked against well established parameters of quality, in order to deliver a defect free range at the customer's end. 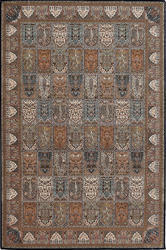 Also, clients can avail the teppich carpets from us in various sizes, patterns and colors.